How Much Running Is Too Much for Your Feet and Body? “I’m almost finished with a Couch-to-5K program,” writes 63-year-old Diane to the running experts.1http://www.runnersworld.com/for-beginners-only/when-is-it-okay-to-run-every-day “The plan emphasizes running three times a week. When is it okay to run every day?” Some people have busy schedules where running consecutive days seems to make more sense. Others find that they love how they feel post-run and want to experience that glorious, motivational “runners’ high” every day. Our podiatrists, sports medicine doctors, and rehabilitation specialists often field this sort of question, so we’d like to offer our two cents here for all you avid New York runners who want to lead a healthy lifestyle free from foot and ankle injuries. One of the primary reasons for running injuries, particularly of the lower extremities, is ramping up training too soon — before the body has a chance to adapt to the increased stress load. While every body responds differently, it generally takes about six months to develop a solid base for training. Couch-to-5K programs offer a good, responsible start, but being only two or three months in duration most of the time, you still have a ways to go before you’ll be ready to run seven days a week. Many runners we meet with are working professionals who are short on time during the week and want to know if they can “catch up” on the weekends. 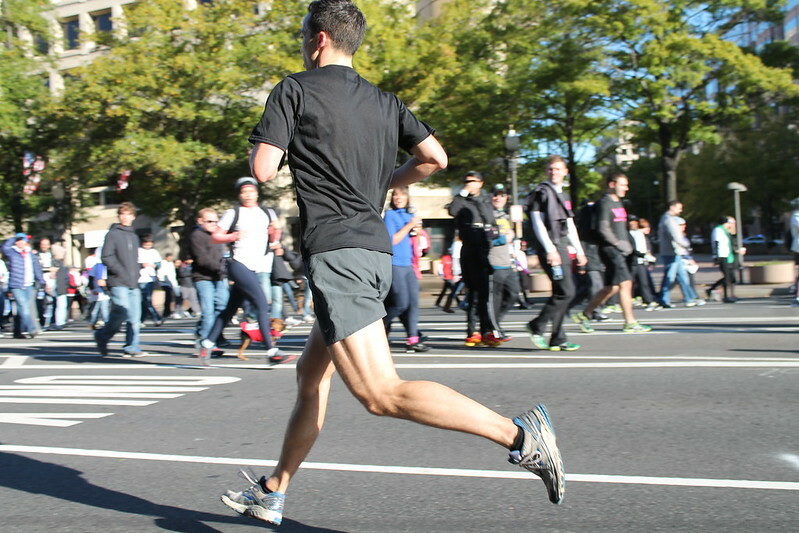 Like Washington Podiatrist Lee Firestone, we tell our patients their weekend miles should never be more than half of the total mileage for the week.2https://www.washingtonpost.com/lifestyle/wellness/how-runners-can-keep-their-feet-happy/2014/06/17/4026479c-f0f3-11e3-9ebc-2ee6f81ed217_story.html So, if your goal is run 20 miles this week, you should run no more than 10 on the weekend. Do not increase mileage by more than 10% each week. So if you run 10 miles this week, do 11 miles next week, 12 miles the week after, and so on. Are You Giving Your Body a Chance to Build Strength? Recovery days allow the body the time it needs to gradually strengthen itself and accommodate the new demands. Overuse injuries like tendonitis, muscle strains, shin splints, plantar fasciitis, and stress fractures occur when we ask too much of the body too soon. Are Your Running Shoes Good Enough? Another factor we address at our NYC podiatry center is choice of footwear. There are many different brands for different types of feet. Switching up your shoes annually may be nowhere near the proper frequency, given how many miles you’re clocking. Check out our archive of posts on shoe choice or stop in to see us and discuss footwear selection. Running experts say you need to run a good three days a week to truly benefit and progress.3http://running.competitor.com/2014/08/training/running-101-how-often-should-you-run_12188 But what if those three days leave you wanting more? To get the most out of a three-day running week, focus on: a Speed Day, a Strength Day, and a Long Run Day. For your speed day, alternate two minutes of hard running, followed by three minutes of recovery. For your strength day, run with ankle weights. For your long run day, focus on increasing the distance of your run by 10% each week.4https://www.aapmr.org/patients/conditions/msk/Pages/runfact.aspx Increase your mileage for three weeks and then back down for a recovery week. If you feel like you want or need to do more to keep the momentum going, you can add two days of aerobic cross-training activities like rowing, cycling, swimming, tennis, or elliptical trainer workouts. These exercises use different muscle groups in different ways, which will prevent fatigue and help you build greater strength. You can do 45-60 minutes at a shot for maximum value. Running too much isn’t just about increasing your risk of physical injury — although injury treatment and prevention is our area of expertise here at The Center for Podiatric Care and Sports Medicine. Sometimes you should dial back on your training because it has become an addiction that is unhealthy for your mind, as well as your body. If you’re running more than once a day, unless you’re a professional, this could be a tip-off that you need to rethink your motivation for running. A story from Alta Mira reveals that exercise addiction can be a very real problem. “It was like I was in an altered state,” 27-year-old Charlotte told her recovery program counselors. She added, “When I was running, everything was okay, and when I wasn’t running, all I wanted was to feel that sense of control and stability again. Other things just stopped mattering – running was the only thing that made me feel any sense of satisfaction or accomplishment.” Not surprisingly, Charlotte’s running obsession eventually landed her with a broken foot bone, opening her eyes to her need for treatment. The doctors at the Center for Podiatric Care and Sports Medicine in NYC are avid long distance runners as well, so we understand the difficulties of injury recovery. We use all the latest tools, technologies, treatments, and training techniques to help you get back to running as safely and as soon as possible. Contact us to discuss a recent injury or for more assistance preventing ankle and foot injuries.